First post of the year post work. I’m loving the nights drawing out, though the window of opportunity is still small. I came home earlier in the week and cooked a Thai prawn soup and some sticky jasmine rice, it’s a quick dish but by the time it was ready to eat it was dark and I couldn’t take a decent picture, so tonight I knew I was on for a bit of a challenge to get this ready in time. And indeed it paid off. The humble carbonara is one of those dishes that you can rustle up very quickly, perfect for mid week suppers when you’re pressed for time. I got it ready in just 30 minutes. You’ll read about and hear of lots of ways of making a carbonara, but when I’ve tried some of them in the past I could never be guaranteed a good result – but this recipe does so long as you work fast. Instead of dicing the courgette for this I chose to ribbon them on a fine setting on the mandolin (mind your fingers). I like how the slender, flat ribbons fold gently amongst the taglierini, trapping its light, creamy sauce in between their folds. In a measuring jug or bowl combine the cream, egg yolks and Parmesan, whisk together with a generous grind of black pepper and scrunch of sea salt. Bring a large pan of water to the boil with some rock salt and bring to a rolling boil. Whilst that’s boiling heat a large frying pan up on a medium-high heat and add a glug of olive oil, then add the smoked pancetta/bacon and fry for around 5 minutes until its turning crispy, then add the courgette ribbons, continue to cook for around 5 minutes, carefully turning them over in the pan so they cook on all sides but don’t break up. Whilst they’re cooking for 5 minutes put your taglierini on to cook (they take 3 minutes). 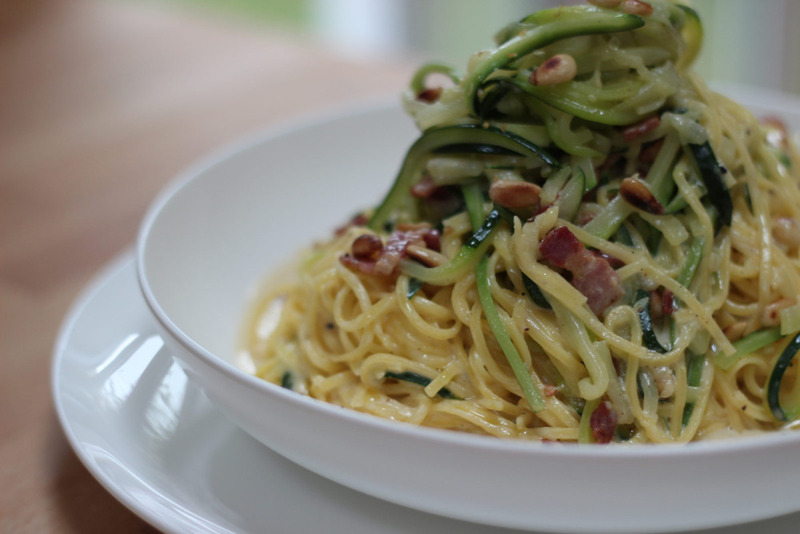 When the courgette strands have all been covered in the oil and are turning translucent and a little dark at the edges, add the garlic to the pan, whilst that’s cooking for a minute (toss it through the courgettes) ladle out 3 ladles of pasta water into the egg and Parmesan mixture. Now quickly drain the pasta, then add the pasta into the courgette pan, toss it through the courgettes, turn off the heat and pour the cream mixture into the pasta pan with the fresh herbs. Stir the mixture through the pasta and courgettes, it will thicken slightly with the heat. Decant the pasta into bowls, drizzle with a little extra virgin olive oil and eat.